Help us celebrate 50 years with a Mardi Gras event on Saturday February 25th 2017 at the Sylvania Country Club. SAVE THE DATE. VOLUNTEERS needed. Weekly meetings to plan this event will be held at the Common Space every Saturday at 10am (subject to cancelation). Are you ready to expand your cultural horizons and share your language and culture with French students? The Teaching Assistant Program in France offers you the opportunity to work in France for 7 months, teaching English to French students of all ages. Each year, over 1,100 American citizens and permanent residents teach in public schools across all regions of metropolitan France and in the overseas departments of French such as Guiana, Guadeloupe, Martinique and Réunion. Are you a French "alumnus"? An international platform France Alumni USA is being launched by the French Embassy and Campus France to promote networking among people who has studied, done research or internship in France. If you have spent a part of your studies in France whether for higher education, short or long study abroad program, research, internship or language courses, we would love for you to be part of this new global France Alumni network. Members have access to job and internship offers, invitation to special events organized for alumni, networking opportunities, and resources to value their experience in France. This is a place to create and explore new opportunities and reconnect with others. Video conference Christiane Taubira on October 10th at 6pm – Wayne State University - 328 Manoogian Hall, 906 West Warren, Detroit MI 48202 - Map. The Alliances Françaises de Detroit and Grosse Pointe in partnership with Wayne State University have the pleasure to invite you to a live broadcast conference with Christiane Taubira in French with English subtitles. 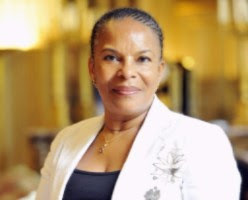 Mrs Taubira Minister of justice until January 2016 resigned her position after a disagreement with President Hollande over policies related to the treatment of French Nationals convicted of terrorism . On October 10th, she will give a talk on Justice in service of Equality and will be open for questions. The conference will be followed by a reception in the French Room (407 Manoogian). Please register before October 7th by email at alliancefrancaise@frenchinstitute.org or by phone at (248)-538-5440. Described as “vintage Paris chic meets New York cool in swinging electro-beats” Ginkgoa compose French songs with an American vibe, and American songs with a French touch where time periods would cross and inspirations would collide. They only have one idea in mind: to make generations of people dance, sway, and sing along to melodies that stay in your head. Officially discovered in the well-known French festival Les Francofolies where they won for “Favorite Group” of the festival, Ginkgoa went on to play 200 dates worldwide. See the film "Goya in Bordeaux" as part of the Toledo Museum of Art's "Art House Film Series". Friday, September 23, 7PM No charge. Enjoy a French film at Way Public Library in Perrysburg, and it's free! Marion Cotillard received an Oscar nomination for her performance as Sandra, a Belgian factory worker, in this French social drama. Sandra is an economically and emotionally depressed wife and mother who returns to her job after a medical leave to find that she has been laid off. Her boss gives her one weekend to persuade her co-workers to give up their own much-needed bonuses to allow her to stay on. Despite her fragile psyche, out of necessity Sandra summons the courage to reach out to her colleagues. She finds them in varied desperate circumstances of their own. Is it possible to find a decent solution to the complex dilemma that has pitted worker against worker? This movie will be shown in French with English subtitles. Adults only. Refreshments will be provided. Registration is not required. After critically acclaimed runs in both France and parts of the African continent, Quartiers Lointains short films series is touring for the first time the Midwest with two special guests: founder and curator Claire Diao and filmmaker Alice Diop (Chicago only). The four outstanding shorts from young French-African filmmakers: Yohann Kouam, Jean-Charles Mbotti Malolo, Zangro, and Alice Diop will be presented at the Museum of Contemporary Art Detroit (MOCAD).